No more tricks needed to access your favorite social networking sites, chats, email and more only from Smart. No need for proxy, IP’s, Opera Mini, UC Browser HUI mods and tweaks on your mobile configuration needed just to access free chat on Facebook, Yahoo Messenger, Mail, Twitter and other Yahoo Services. All is made easy by Smart using their latest free portal app ‘Smartnet’, allows you to connect to your favorite sites without worrying of mobile internet charges. Continue reading more about Smartnet after the jump break. Just download the Smartnet App which is available for Android, iOS and also support java phone users by just accessing the mobile site m.smartnet. Then, sign up to create an account on Smartnet. 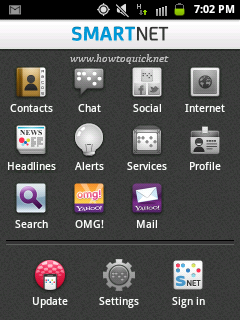 Just link your Facebook and YM account to keep in touch with your love ones and friends using free chat via Smartnet. Want to be updated on about the latest happenings on Facebook and trending topics on Twitter? All that in one place only from Smart ‘Smartnet’. Just authorized Smartnet to link your Facebook or Twitter account to make it possible for you to update and get updated with latest internet news for free. Offers easier way to subscribe, inquire and view call and text and data packages from Smart. Also offers Yahoo Services like Mail, OMG and Yahoo Search for free via Smartnet. You can get connected without worry mobile internet data charges by making sure that your in Safe Browsing Mode. Smartnet can be access even if you’re on Internet Mode off, also you will be notified when you are trying to accessing third party sites. You can use SmartGPRS and SmartNet settings in connecting to Smartnet.